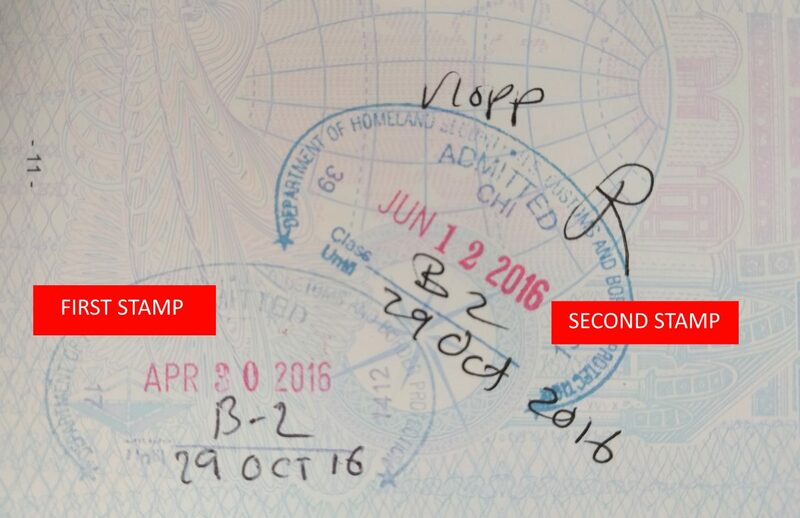 I want to know what's the red stamp with the date for and the other stamp that has the date until apr 27,2017. They ask me how long I'm going to stay and I said a month. If there's any changes with length of stay. Do I have to leave on the 27 of April or I can stay until the usual validity of stay which is 6 months? I cannot see a stamp that say April 27. In particular, I can clearly make out the letters "AR" in the month section of the second stamp, which would not be there if it said "APR" for "April." Because of the fold of your passport, the letter "M" is missing from "MAR" for "March." This stamp has no particular extra meaning. As such, you were admitted on March 27th for six months duration. It's always a good idea, as phoog recommends, to check your electronic immigration record at i94.cbp.dhs.gov, to confirm that you were admitted for six months. 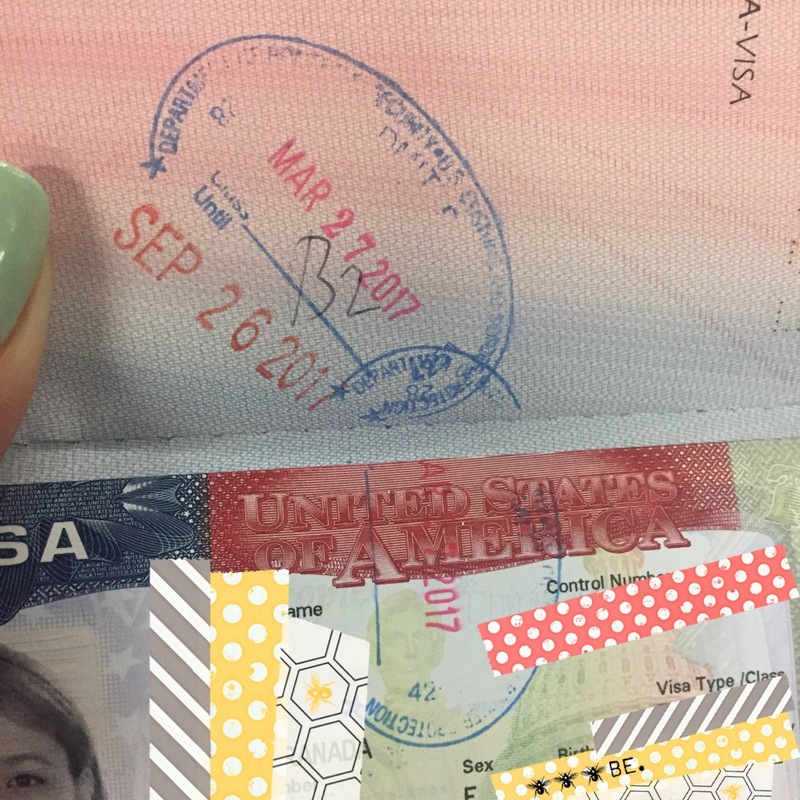 It's worth mentioning that you could face further questioning on future trips to the US if you use your visa in a significantly different way than what you said your intentions were. If you said you were coming to the US for a week to attend a conference, and then actually stay six months, you might be asked to explain the reason for this. That's very common. They have the stamp marked for 6 months from today's date and they stamp all passports the same, unless exceptions. They ask you for long are you going to stay in the US to make sure you're not going to work and sounds reasonable for the reason you're going. If everything is OK, they stamp with 6 months. I'm sure you can stay there until Sept 26 at midnight. In my case, I stayed for 5 months in total. 3 months before and 2 months after a short trip to Mexico. Because many people leave the country for a few hours/days to extend their passport valid period (ie, 6 months + 6 months), when you return they might not want to extend your stay for another 6 months. In my case they stamped it with the initial 'Valid Until' they put the first time I went in. Since either the passport stamp or the electronic I-94 can be used as legal proof of your admission to the US, it's a good idea to make sure they're the same. This can also assuage any doubt in the case of ambiguity on the passport stamp. Not the answer you're looking for? Browse other questions tagged usa customs-and-immigration passport-stamps or ask your own question. Do I get a new stamp every time I come to the US even if it's inside the last time period?